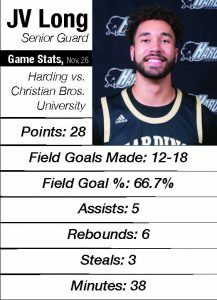 Senior point guard JV Long erupted for 28 points in the Harding men’s basketball game against Christian Brothers University (CBU) on Monday, Nov. 26. The graduate transfer has become a leader on the team, but his journey to Searcy has taken him around the world. Sherman Jovahn Long V was born in Germany. Although Long was named after his father, his mother was not a fan of the name Sherman, opting instead to call him by his middle name. In middle school, his classmates shortened his name to JV, and the name stuck. Long’s mother was a track and handball athlete and helped Long develop a passion for sports. However, during his time in Germany, he never showed an interest in basketball. Long and his mother eventually moved to Arlington, Texas, where he was exposed to a new world of sports. Long would not play competitive basketball until he was in junior high, and even then, his coaches and friends thought he would pursue football over basketball. Long surprised everyone his sophomore year of high school when he made the decision to quit football in order to focus all his energy on his basketball career. He said his football coaches called him and asked him to change his mind. Along with the change of priorities came a change of position. During the summer before his junior year, Long played Amateur Athletic Union (AAU) basketball and made the transition from playing shooting guard and small forward to running the point. His experience playing positions typically reserved for taller players gave him an edge when running the point. He went from being one of the smaller forwards to one of the taller point guards. Long would continue his career at Cameron University in Oklahoma. His freshman year, he rode the bench as a redshirt athlete and got the chance to watch All-American point guard Craig Foster. His sophomore season, he was forced to take a medical redshirt after tearing his ACL. Again, Long had to sit on the bench and watch the game instead of playing. That time on the bench payed dividends to Long who would be named to the Lone Star Conference’s All-Freshman Team the next season. His next two years, he would be awarded All- Conference honors. Long averaged 10.5 points, 3.9 assists and 4.1 rebounds per game. Long led the team in points and rebounds in both his fourth and fifth year on the team. Following the 2017-18 season, Long was left with a decision. Even though he had been a Cameron student and player for five years, he still had one more year of eligibility remaining. Long graduated from Cameron with a degree in biology, but he realized in order to become a physician’s assistant (PA) and participate in PA school, he would need to take more medical classes which were not offered at Cameron. So, Long left behind his home once again, this time coming to Searcy. He is taking more medical classes to boost his PA school resume but has no intention of earning a Harding undergraduate degree. His adjustment to the Bisons locker room has been a slow one, but he said his experience at Cameron has prepared him to play at this level. “Because he has such a great work ethic, is a great teammate and leads by example, it also has allowed him to be a vocal leader in a really positive way,” Harding Men’s Basketball Coach Jeff Morgan said. Junior guard Colin Hale also transferred to Harding this year and was one of JV’s first friends at Harding. In his first game this season, Long said the reality that he was no longer playing for Cameron really sunk in. After putting together consistent 10-point performances early this season, Long finally had a breakthrough game against CBU Monday night. His 28 points were the most he has scored all season. He added six rebounds, five assists and three steals. “Having a game like that definitely builds my confidence for the rest of the season,” Long said. Long is not the first sixth-year senior to play for Harding. Matt Hall played six seasons with Harding, although he also redshirted two seasons. Hall was named an All-American and is recognized in the Harding Sports Hall of Fame. His jersey hangs from the rafters of the Rhodes-Reeves Fieldhouse. 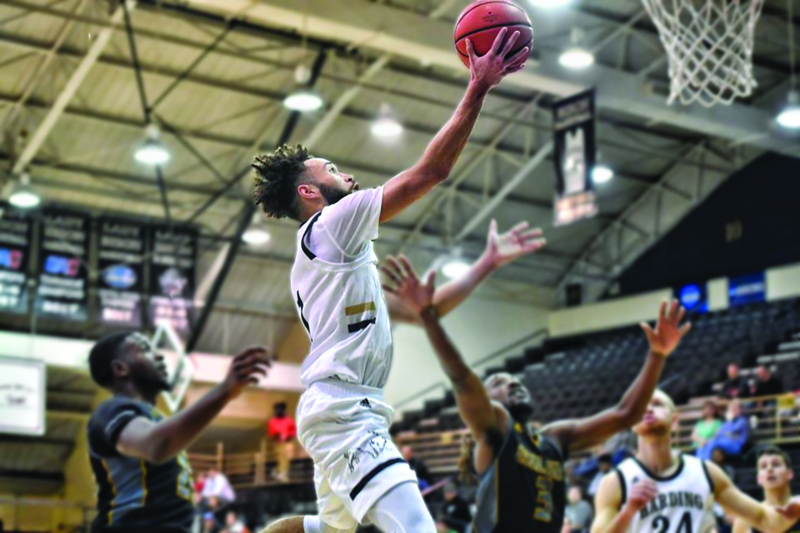 While expectations for Long this season are not nearly as high, he believes his basketball intelligence and the feel he has gathered for the game will help lift his teammates play and lead Harding throughout conference play.